Tutorial on Programming the NeoPixel (WS2812) RGB LEDs and Equipment Giveaway! In this episode Shahriar takes a close look at programming the popular NeoPixel RGB LEDs using a PIC microcontroller and C-language. A close-up of the NeoPixel (WS2812) LED is shown with attention to identifying various semiconductor elements inside the package. The principle operation of the LED is the described along with a detailed explanation of the pins and the one-wire communication protocol. A simple evaluation board for the PIC18F4550 is used to drive a circular array of 60 NeoPixel LEDs from Adafruit. After presenting the difficulties of providing an accurate pulse-shape using the C-language, the measured waveform is shown on a Tektronix MDO4000B. Finally, the code for a circular color rotating pattern is presented and demoed. The code for the experiment can be downloaded here. There is also equipment giveaway! A TPI Scope Plus 440 and a Tektronix TDS2232 are being given away at no charge! Please leave a comment on the video or on the website. You must be a resident of the USA to receive the giveaway. A winner will be chosen at a later date and notified via email. There are some files missing. Where are int8, output_high, bit_test etc. defined? I downloaded the code, But can’t fine where you defined these. SO im a little lost here. i am looking for someone to create patterns for led strips (arduino / C-code). if any of you know of someone please let them know to contact me. thanks. Where would I find the correct data sheet? awesome guide but im having a problem. im porting the code to a tiva c launchpad but need to get the code for the bit test function as thats the only problem im having with it. Thank you for this video. Your observation about the bit waveform is extremely helpful and will save me time!!! I hope it’s not to late but i would like to participate on the giveaway. I’m a college student who uses a 6$ multimeter for everything. I’m dreaming of a osilascope or something to measure frequencies. Perfect I was just looking in to playing around with a PIC controller and was thinking if I could use it to drive rgb pixels. Now if we could get the ring in 12″ circle that would be awesome. do u still have the 440 plus oscilloscope..thank you.. I enjoyed your video. I went through pretty much the same thing and it’s nice to see a good explanation of what it takes to get hardware working together. // PIC16F1459 — at 48 MHz (12 MIPS) because that’s what I had handy. // compiler. Keep the code simple — unroll loops, simplify tests, etc. // enough PIC assembler to code it the right way. // These delays are tuned for a PIC running at 12 MIPS (48 MHz oscillator). // For 16 MIPS (64 MHz) use 12, 2 for SEND_ONE and 5, 10 for SEND_ZERO. // Send pixel data from the stripReds … arrays to the strip. // inline here and skip the function call overhead. Great tutorial. Thank you for the back to basics approach. I’ve wanted to start programming and have some pics, but have never used them. I’ve looked at the arduino, but didn’t really want a black box solution. Perhaps I have it all wrong, but that is my beginner take. Well done. The WS2812B chip uses a very simple state machine that does not care about the particulars of the most parts of the data signal timing. It turns out that there are only a couple of timings that actually matter. It is no problem to leave the NeoPixel data line low longer than spec’ed as long as you do not leave it low long enough to trigger a reset, which turns out to be in the range of 5us-10us. I was glad to find your presentation on NeoPixels. It got mentioned on a PIC forum for picBasic Pro (http://www.picbasic.co.uk/forum/showthread.php?t=18431&p=127934#post127934). I especially liked your comments on arduinos. While it is awesome that they open up interest in electronics, they don’t require you understand too much about the inner workings. Thanks for taking the time. Now I need to get to work and play with mine. This is really cool! What is the smallest PIC that this can run on? 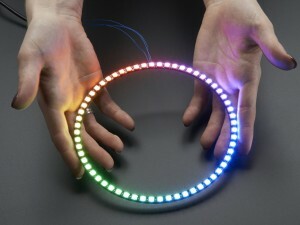 I have been trying to figure out how to play with these LED rings for a while. This tutorial has been tremendously valuable. Thank you so much! Congrats on the Hackaday feature! It’s what led me to your site, and I’ve found a lot of useful things here. I absolutely agree that Arduino can obscure a lot of the inner workings of the micro controller, which can seriously limit the value of the projects produced, but I’m glad that you don’t look down on the platform. Lots of experienced engineers snub Arduino, but I believe it’s an invaluable stepping stone to bigger and better things. I started out with Arduino before being introduced to raw AVR and ARM. Some thoughts on the Neopixel’s timing complexities, although I agree that the duration of the high signal is probably the important part. When I was browsing the data sheet, I noticed the WS2812 they use gives a signal frequency of 1.25 us +/- 600 ns. Perhaps this 50% error flexibility is part of what allows the chip to work despite the timing issues. One other thought: won’t the longer signal frequency decrease the refresh rate of the Neopixels? Adafruit’s guide claims a 400 Hz refresh rate, but according to my rough calculations the longer signal frequency coding for 1 would lead to a refresh rate of approx. 350 Hz. Not sure that small difference matters much since they look great and only require one pin, but it’s something to keep in mind. Obligatory giveaway note: as a recent college graduate, equipment can be tough to come by. I try to use the scope at my internship when I need it for my projects, but a scope of my own would make a big difference when I’m debugging an idea I had at 1 AM. Great video! Hackaday brought me here, and I’m glad it did. I’ll be visiting thesignalpath regularly now to watch all your other videos. As an arduino experimenter, I really appreciate the time you take to explain the low-level fundamentals of your project. I’d love to see this scaled to a hula-hoop. Two color-chase hula hoops on one girl in a nightclub with UV lighting = win (isn’t that why we guys hack things?). Nice work and explanation. Awesome giveaways. Thanks for the tutorial. I have been considering a neopixel clock and think this tutorial might be a good starting point – thanks! Nice video. It was very nicely detailed. With regard to NeoPixel Timing, hackaday.com had a link a while back to someone’s analysis. It’s http://wp.josh.com/2014/05/13/ws2812-neopixels-are-not-so-finicky-once-you-get-to-know-them/. Not so coincidentally, I found your website through hackaday.com. I like this, it’s something that I would like to try and add to my daughters halloween costume. Nice video. Is 128 the maximum number of addresses for using these neopixel type LEDs? Great work Shahriar! I just got the 16 LED version and was playing with it using an Arduino and wanted to get into the Adafruit libraries to learn more about what makes them tick but this is way better. Was also thinking about what it would take to create a matrix of these and muxing some video onto them. Really enjoyed your video; found you on hackaday. A year and a half ago, I jumped into electronics after many years of wishing I could make the first step. I’ve been pretty successful with Arduino but have always felt like I was cheating a little by not having a better understanding of the fundamentals. I would make good use of the Tektronix oscilloscope in furthering my understanding of electronics and my goal of building a clock from something that’s not based on a development platform. Awesome! I just recently got my hands on some WS2812b leds! Although, not on a ring =[. Individually soldering them has been a pain. Definitely cool seeing this run on a PIC! Intersting video, I’m surprised how many people try bitbanging these LED drivers rather than using a serial-port peripheral on their MCU. Nice work! I would love to win that scope! Thanks for the tutorial and especially for the code–I learn best by looking at other people’s code! Because of my poor internet connection, I have to download the video in several tries; it will take a while to get through all the pieces. This is a great video and it’s becoming more and more difficult to find good videos that illustrate the subtle things of building, modifying, or designing the fun little “projects” that exists on the net without using arduinos or other simple kits. It would be interesting to add smaller and smaller rings to the inside of the large ring. Could produce some intertesting effects. I’m currently trying to learn enough about FPGAs to animate one of the 32 x 32 led matrices that Adafruit sells.. Very nice introduction, thank you! Cool! I’ve just gotten into the embedded world through Arduino. I’m doing some projects with multiplexing 7seg displays so this is relevant to me as I look toward getting more into the nitty gritty of microprocessors. Awesome. I’ve wanted to do the same for a while. Very good tutorial. It’s refreshing to see someone explaining this for people who have not yet gotten into microcontroller usage. Where others are saying use this or that Ardunio ans such and such library, it’s nice to see how to actually program a microcontroller for a specific purpose. Very well done. Thank you. This is actually a really cool experiment! I am in the process of using a PIC18f4550 to drive a bunch of the surface mount equivalents of the NeoPixels for a Tetris board, so this is actually a very useful tool to consider. I was having some timing issues with driving these LED’s, but hopefully this can at least sort out that issue. Internally every LED has a local oscillator which is used in a clocked state machine. You’re right, only the high period matters. As long as the line isn’t low long enough to cause a reset. Excellent tutorial, this is exactly what I needed to help me move past Arduino and into the world of PIC! Thanks for taking the time to share the knowledge. Hey man, grats on making Hackaday and thanks for teaching me more EE in 30 mins than I’ve been able to teach myself in the last month. The Tektronix give-away is awesome; please consider me for it! I have some ideas for a really old KVM switch I found, but I can’t find a local second-hand scope to save my life. I know you’ve done a few reviews, but I wonder if you can let all us wannabe hackers know what kind of specs and features we should be looking for in an oscilloscope? Also, where would be a good place to get a low-cost, second-hand scope? Thanks again! Excellent! This would make an awesome halloween dog collar! It’s cool how you got the communication to work with just one I/O pin. Thanks for the video. I’m a computer science / computer engineering background kind of guy but I have a 9 year old boy that is really starting to get interested in electronics so it’s on me to figure things out and get us started together. That’s what I’d use the equipment for…..learning for both of us. The is an article on josh.com about the timing requirements of neopixels. Been seen your videos and are of a great interest to me, I’m a hobbist and electronics for me it’s a big step in moving forward, I still need to grow more and learned in this field but looking forward to do so in the future…test equipment it’s in need for me since I’m not sure what’s best to start with. Thanks. I love your videos! So glad you’ve made more! I am a software engineer but have learned tons from your blog. Thanks for sharing your knowledge with the world! And thank you for another great video! I just love the way you explain things in the realm for electronics so that armatures like me actually can follow along. Your video could probably not have come at a better time as I’m developing at PBC based on the WS2812B chip/LED. The design is similar to my white LED version http://letsmakerobots.com/node/37574 but this time with RGB to have access to a broader light spectrum. My question is really more related to the power supply than the RGB LED. Could you recommend a voltage regulator setup that could supply me with the needed 6A+ current? I would like this to be incorporated into the PCB so I only have a single power source for the complete device. I really like your educational videos style and almost weekly I refresh the main page hoping to find a new clip. Is it too much to ask for a video series about LCD types, functionality, interfacing ? i love the videos. thank you for showing the TPI 440. i might be able to buy one someday. i had been looking for a fluke 196b, but it is like checking the price of a Ferrari for the third time sure that the price on the first two times was wrong. anyone else who requests the tpi deserves it more than me. i just want a significant number viewers to request the giveaway. thank you for all of the effort you put into this site. Colegio de Ingenieros en Audio A.C. Excellent video. I’m not eligible to receive any of the giveaways, I own a Rigol DS1102E. I wanted to comment that the timing for the Neopixels is not as strict as the datasheet might initially suggest. This link has more information, Josh was able to run a string of 1000+ of these LEDs using the normal Arduino. Thanks again for the awesome video I enjoy your style and examples very much. I watched the Tutorial on Programming the NeoPixel and found it very interesting and informative. The grandkids would love the NeoPixel rings. Please consider me for the equipment give away. Thanks for the great video. I’ve spent a lot of my weekend watching stuff on your blog. As an embedded programmer, I’m all for getting into the low level (well, at least to the C level, though doing this in assembly would have been fun too!) Seeing this video after the RGB LED/RGB detector video makes me want to see some kind of crazy light based data protocol… If only I had the time. PS. I just thought I’d mention that maybe you meant to do a logical && instead of the bitwise in the NeoInit() ? This was super helpful – I’ve been eyeing these LEDs for a while. Came here from r/electronics. Awesome giveaway too – I’d like to enter for the TPI Scope. I wanted to let you know that I learn heaps from your videos and I really enjoy them. Some of the things that you’ve covered were just at my limits of comprehension, but I always follow along and usually pick it up. You are a great teacher. I also wanted to let you know how great I think it is that you are helping others trying to get into electronics with this giveaway. It really is very generous of you.